Do you have an essay, research paper, term paper, or dissertation assignment that you simply cannot figure out how to write? Student Network Resources’ custom essay writing service means that you supply the information you need for your writing assignment: type of assignment, topic, how many sources you need, writing style, and any other directions that you have for the essay; and one of our skilled and experienced writers provides you with a custom-written essay that you can use as an example for your own writing. Not only do you get the benefit of a professionally-written essay that matches your exact specifications, but you also get a powerful learning tool that can help you improve your own writing skills. Before you can write an essay, you have to understand what an essay is. Obviously, an essay is a writing assignment, but is that all an essay is? The answer is yes and no. Used colloquially, the term essay refers to any type of short non-fiction writing. From an academic writing perspective, there are four other characteristics that need to be included in an essay: brevity, non-fiction, centered around a thesis, and engaging. If your piece of writing does not include these four characteristics, then it is missing a crucial element to be a successful academic essay! In addition to the broad definition of essay, your assignment probably has some type of qualifier. You may be asked to write an essay that fits into one of the following categories: narrative essays, argumentative/persuasive essays, descriptive essays, and expository essays. Failing to write the correct type of essay can result in a failing grade, because each essay comes with its own guidelines and expectations. Narrative essays tell a story and may even be in first—person format. Argumentative or persuasive essays try to convince the reader to adopt your point-of-view. Descriptive essays try to get the reader to understand an experience. Finally, expository essays explain an idea or topic. Whatever topic you choose; the type of essay you are asked to write is going to change your approach to the topic. 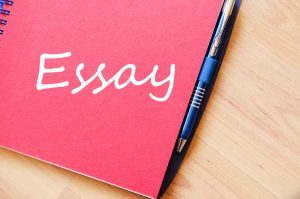 Many students are simply overwhelmed with essay assignments, and uncertain how to understand the assignment, much less turn that understanding into a successful essay. That is why we offer custom-written example essay services for our customers. You give us the exact details of the essay you want us to write, and we create an essay that meets all of your specifications. What does custom written mean? Well, at Student Network Resources we have a plagiarism-free guarantee. That guarantee means that any material that is not original and is used in your essay will be correctly cited according to the citation style that you designated. If material is not cited, then you can be assured that it is original material written specifically for your order, according to your specifications, and not previously provided to any other customers. In other words, if you pay for a custom written original order, you get original writing. While a zero plagiarism promise may seem simple, we are one of the few custom essay providers in the business that stands by that promise. In fact, our customer service is one of the factors that turns first-time customers into repeat customers. We believe in our service and we are happy to bring it to our customers. We are a U.S. company, founded in 1998, and committed to protecting our hard-earned reputation as one of the leaders in our industry. We only work with native-English speaking U.S.-based writers, and all of our writers have a master’s degree or higher in their areas of expertise. Our writers come from diverse backgrounds, but all of them are familiar with the exacting requirements of academic writing. Our diversity means that we can fulfill orders in almost any subject area, without sacrificing writing quality or expertise. We are not the cheapest essay service that you will find. We want to be honest with you about that. You can find other services that promise you custom-written essays for lower prices. But, have you ever heard the expression, “you get what you pay for?” Well, we firmly believe that is the case with custom-written essays. We know that to continue to meet our exacting standards and satisfaction guarantee, we have to keep our writers. We also know that to attract and retain the best writers in the business, we cannot pay them pennies a page. We pay our writers well, but still manage to pass savings onto our customers because our writers are experts who have figured out how to handle high-quality essays quickly. What does that mean for you, as a customer? Affordability. Price is only one aspect of affordability; quality is the other. Affordability means getting the ultimate combination of low price and high quality. We are not the cheapest service, but we think that we are the most affordable. Our prices start as low as $18 per page, and even rush-orders or extremely complicated assignments max out at $39 per page. We can even have some essays completed in as few as three hours. There are many companies out there that promise custom writing, but deliver far less. Try our essay writing service for your next example paper and find out how we have been helping students become better writers and earn better grades for almost 20 years!